Nolan Preece injects the spontaneity of serendipity into the photographic experience with his “Chemigrams” exhibition on display in the Cardenas Gallery at the International Museum of Arts & Science. The exhibition consists of a selection of 25 images achieved through a blending of processes, including traditional photography, experimental photograms, painting, printmaking and digital finalizations. Preece moves to the craft side of photography to explore chemicals and combinations of processes, not only those common to the field, but those not commonly associated with it. 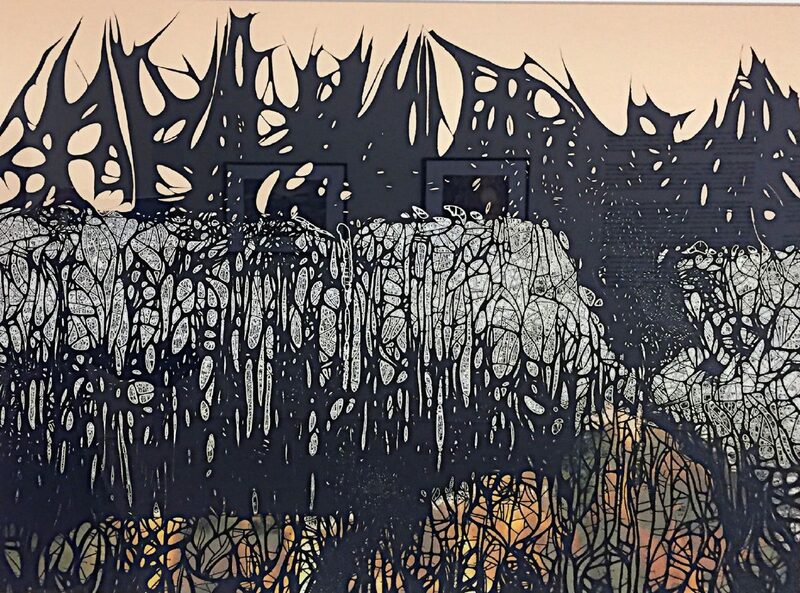 Although the lines and textures in these works take the viewer into an abstracted and introspective vision, they are basically landscape informed. These images are landscapes; the artist-photographer has overlaid and redefined his original landscape photographs through an interesting and remarkably process-heavy technique. According to Pierre Cordier, who is credited with defining the chemigram process in 1956, “The chemigram combines the physics of painting (varnish, wax, oil) and the chemistry of photography (photosensitive emulsion, developer, fixer); without the use of a camera, an enlarger, and in full light.” Think super photogram. 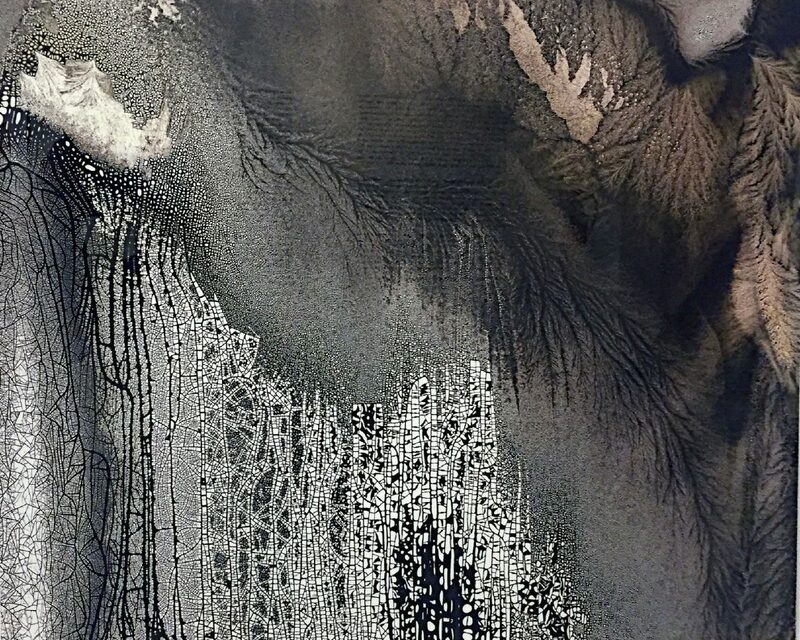 Preece adapted the process and pushed it further by painting on the surface of photographic paper prior to developing, and incorporating the printmaking technique of cliché-verre, in which he drips solvents on smoke-on-glass. A patterned matrix is created and exposed on photographic paper with an enlarger. And as Preece explained, his process doesn’t stop there. “I have shifted to a hybrid technology by scanning in the resulting chemigram taking it to the digital level,” he stated. Once you get through the information about the technical process offered in the exhibition statement, the resulting prints are quite dramatic and can appeal to a range of viewers. 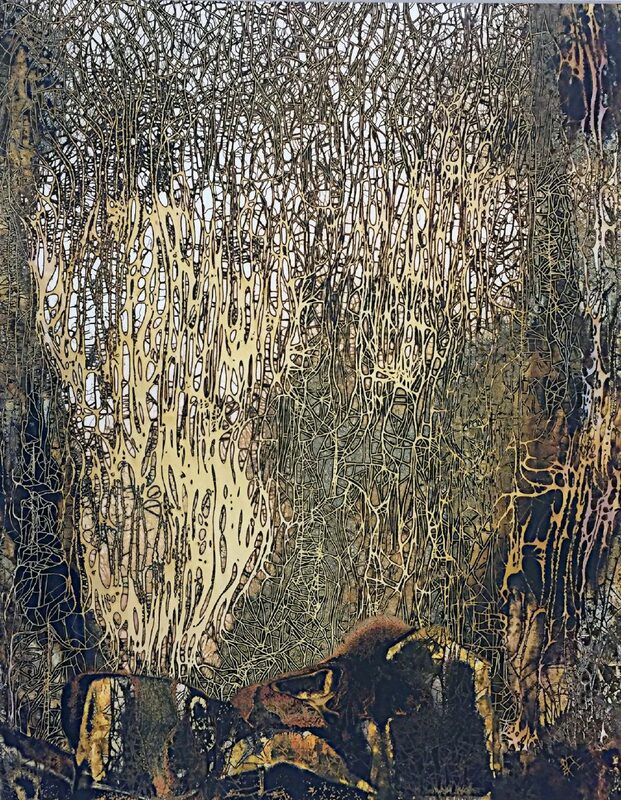 Preece moves from easily referenced landscapes to abstract images that are born anew from the now obscured world we knew. 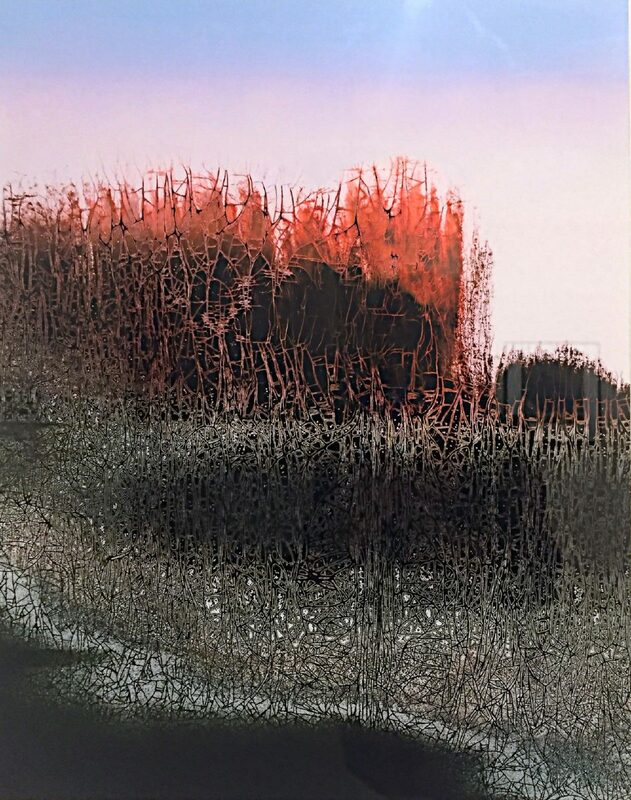 “Evening” reflects the cliché-verre technique by overlaying a delicate matrix to a clearly naturalistic image. “Woodland” goes further with a more boldly defined combination of matrices and evokes a sensation of the aftermath of a fiery disaster. “Summit” offers yet a stronger statement through the combinations of matrices and colors, suggesting layers of geological variations and creating a fully abstract vision. These and many of the works are composed with horizontal compositional sections that seem counterpoint to the physical layers of the process. For me, these were the stronger prints. But the seduction of the cliché-verre matrices in Preece’s work is strong. He produces sensations of landscapes that take them beyond their empirical limits, invoking wonder and curiosity with his beauty of serendipitous patterns. Ansel Adams envisioned the photographic negative as the “score” and the photographic print as the “performance” of that score. 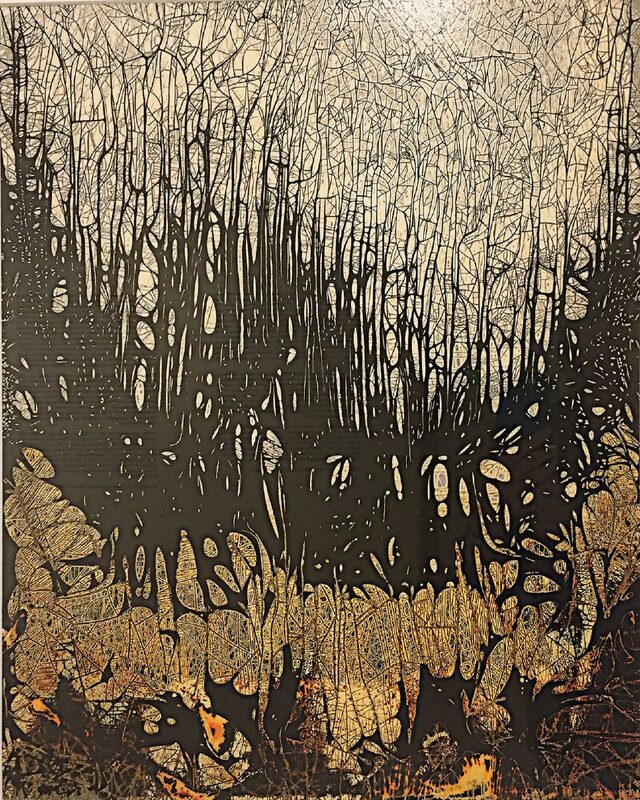 Preece interprets the original chemigram print on silver photographic paper as the “score.” For the “performance” of the print, the scanner, computer, and printer (instead of the darkroom and enlarger, which are now part of the score) come into play. A photographer for more than 40 years, Preece has devoted his work to understanding and mastering the challenging techniques of early photography, and also promoting new processes such as the chemogram (1980) and the experimental process he discovered in the late 1970s using cliché-verre. 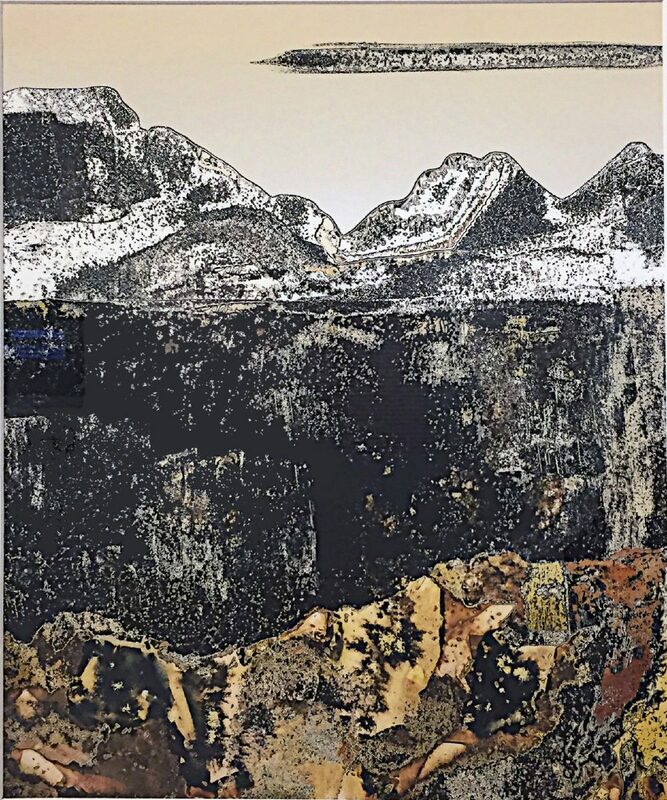 His work is represented in collections, including the Nevada Museum of Art, the Nora Eccles Harrison Museum of Art, Logan, UT and the Utah Museum of Fine Arts, Salt Lake City.